The port of Seyda Neen, "the Gateway to Vvardenfell", is a small village in the southern Bitter Coast region, bordering the Ascadian Isles. 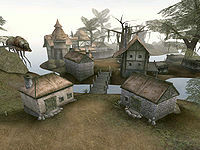 Much of the town was built by the Gold Coast Trading Company in the years prior to the Three Banners War in the mid-Second Era, though it was administered and protected by House Hlaalu. By 3E 427, House Hlaalu still governs Seyda Neen, but the Imperial Legion guards the seaport. 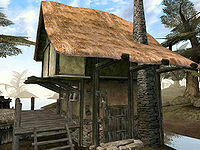 Its native population is small, though it is a common stop for Imperial travelers going to and from Vvardenfell. The Grand Pharos is a unique lighthouse at the harbor mouth renowned for guiding mariners throughout the Inner Sea. Most visitors are processed through the Census and Excise Office, part of the Empire's Coastguard station at the harbor. Though no boats offer travel, Imperial cutters use the dock as a restocking point to control smugglers and pirates running the waters off the Bitter Coast. Silt striders provide convenient travel to Gnisis, Balmora, Vivec, and Suran. Wildlife in the surrounding area include cliff racers, scribs, rats, netch and slaughterfish. There are also dreugh not far off shore. For more information, see the lore article. Seyda Neen is especially significant as the starting point, where you begin aboard a prison ship in the port and where the main quest is begun. Socucius Ergalla is the chief agent in the Imperial Census and Excise Offices. In addition to helping select class and sign, Socucius will provide release papers and training. There is a bedroll that can be used if a safe resting spot is needed. A key, which can be obtained from a shelf next to Sellus Gravius in the second building, grants access to the warehouse across the street which holds armor, weapons, sundries and valuable illegal goods. (Gaining this key immediately requires a steal-and-drop trick that verges on an exploit; see Starting Out § Census and Excise Office for details.) You may also use the Tower Key Power to break in. Training is offered by Adraria Vandacia upstairs in the warehouse. Arrille's Tradehouse is owned by the sole merchant in Seyda Neen, Arrille. He offers a selection of weapons, armor, spells, potions, and scrolls. He will not trade with you if you have Moon Sugar or Skooma in your possession. The tavern upstairs functions as the social hub for the town. Raflod the Braggart offers training and Hrisskar Flat-Foot has an early opportunity to make money. Behind the counter, Elone will give detailed directions to Balmora. She also offers training, but only to members of the Blades. Sellus Gravius is the second NPC you need to talk to; you give him your release papers from Socucius Ergalla, and he sends you on the first step of the Main Quest, to deliver a package to Caius Cosades in Balmora, which is best done before reaching level 4. Giving Fargoth his ring will boost the disposition of Arrille, thus fetching better prices (and you can get the ring back later; get a Fargoth-related quest from the Nord guard upstairs at Arrille's). Return to Socucius Ergalla in the Census and Excise Office for official matters, such as those involving a missing tax collector. For a complete list, see the People in Seyda Neen article. Transportation from Seyda Neen to other locations on the island is handled by Darvame Hleran, located at the silt strider on the northeastern edge of town. A short walk along the road east of town leads to Pelagiad, Balmora, Ebonheart, and into the Ascadian Isles. A trail northwest leads into the swamps of the Bitter Coast and Hla Oad. Strangely, despite this supposedly being the Empire's gateway port to Vvardenfell, there are no boats in Seyda Neen at all during "vanilla" gameplay, except when the Imperial Prison Ship drops you off here under the Emperor's orders. 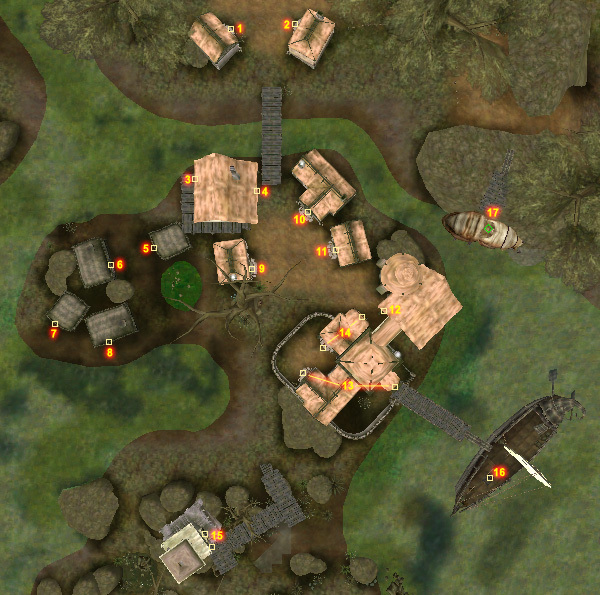 However, with the official Siege at Firemoth plugin, a boat appears for transportation to Fort Firemoth's atoll and back, but it disappears after the related quest is completed (which is best done around level 4 or a bit higher; it is difficult to survive earlier due to the firepower of the numerous Skeleton Archers that will be encountered). Outside the lighthouse, an iron shardaxe lies inside a tree stump. Another stump close to the walkway holds a silver cup and some gold. For detailed starting tips, see the Starting Out article. The Imperial Prison Ship remains on the minimap even after it permanently disappears from the game. 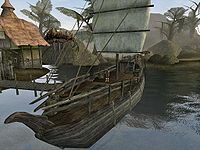 Seyda Neen is the only coastal town in Vvardenfell to feature a Silt Strider as its only means of long-distance travel. Just north of the silt strider is Addamasartus, a smugglers' cave where you can test your combat abilities and acquire loot that can be sold for profit, as well as slaves to be freed to initiate a quest that appears later in the game. The useful Mentor's Ring can be found in the Samarys Ancestral Tomb nearby, to the northwest up the coast. If you decide to walk to Balmora, there are a few things to explore on the way. See Starting Out § The Road to Balmora for details. If you follow the north path out of Seyda Neen, Tarhiel will fall from the sky. See A Falling Wizard for details. West of Seyda Neen, across the water, is Thelas Ancestral Tomb. Vodunius Nuccius: Help a fellow who's down on his luck raise the funds to get home.